The interest rate you lock in when you secure your mortgage has a direct impact on the monthly payments you will be making. That means any increase in rates will increase the amount coming out of your wallet. Keep more money in your pocket by locking in a lower interest rate before the end of the year! Interest rate predictions show that prospective home buyers should not delay! 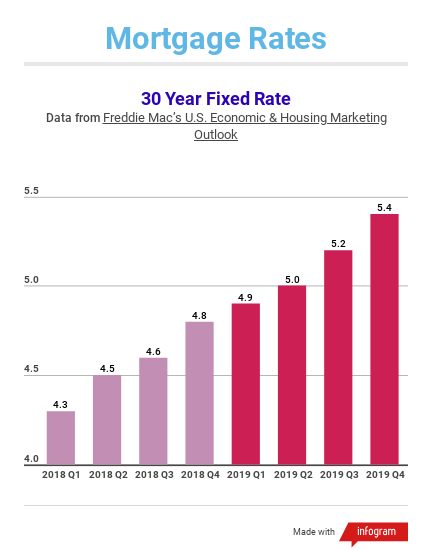 Check out data below which shows the actual rates from 2018 and the projected interest rate increases in 2019. Along with these interest rate hikes, home prices are also expected to rise. According to the latest CoreLogic Home Price Index, home prices nationwide appreciated 6.2% over the course of the current year and are predicted to rise 5.1% between now and next year. If both of these housing predictions come true, home buyers will be paying significantly more every month. Why risk it? Save money and buy today! If you are ready to lock in a lower interest rate, check out our current Homes for Sale in beautiful Ventura County! Give the Blake Mashburn Group a call today or visit our website at http://www.blakemashburn.com/.